Kenny Chesney has managed to score his 15th album in the top 10 of the Billboard 200 albums chart, as his set ‘Songs for the Saints’ was No. 2 in its debut week dated the 11th of August. The album is runner-up to ‘Scorpion’ by Drake, which is top for its fifth consecutive week. The Billboard 200 Albums chart is calculated using multiple metrics to measure the consumption of sets in the United States. The most popular albums of the week are thus ranked, using these metrics which include track equivalent albums (TEAs), streaming equivalent albums (SEAs), as well as traditional album units. According to Nielsen Music, ‘Songs for the Saints’, which was released on the 27th of July, collected a total of 77,000 equivalent album units in the week that ended on the 2nd of August. Most of the numbers were backed by traditional album sales, which totaled at 65,000 units. This is the first album that Chesney has released through Warner Music Nashville, having previously worked extensively with Sony Music Nashville. 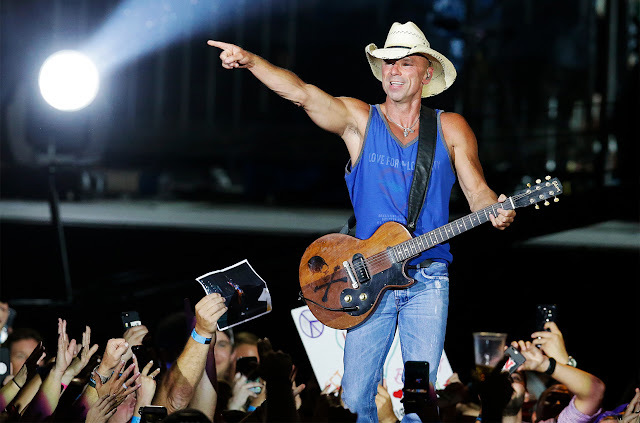 The latest release by Chesney sees him continue his run of logging top 10s on the Billboard 200 albums chart, as since 2004 the singer has had all 14 of his albums debuting in the chart-frame. He had one appearance before 2004, as he managed to land at No. 1 in the rankings in 2002, with ‘No Shoes, No Shirt, No Problem’ occupying the spot. Additionally, Chesney ranks at No. 4 when it comes to most appearances in the top 10 of the Billboard 200 by country artists. At No. 3 is Tim McGraw with 18 such appearances, with No. 2 belonging to Garth Brooks who has 19. The list is headed by George Strait, who has 20 appearances in the region. According to Chesney, the inspiration behind ‘Songs for the Saints’ was the resilience and spirit of the people affected by Hurricane Irma in 2017. Relief efforts being carried out in St. John and the Virgin Islands, are being funded by Love for Love City Foundation belonging to Chesney. The foundation itself is receiving funds from the sales generated by his latest album. Chesney himself, had a home in St. John, which was destroyed by the hurricane. Chesney’s album in the Billboard 200, is followed at No. 3 by ‘beerbongs & bentleys’, which belongs to Post Malone. The set dropped down a place, witnessing a 5 percent decline in units earned at 65,000. ‘Goodbye & Good Riddance’ by Juice WRLD climbed up two places from No. 6 to finish at No. 4, while declining two percent in units earned 39,000. The No. 5 spot is held on to by ‘Invasion of Privacy’ by Cardi B, as it too declined in units, by 6 percent for a total just over 38,000. The other albums in the top 10 are ‘?’ by XXXTentacion at No. 6, the soundtrack to ‘Mamma Mia’ Here We Go Again’ at No. 7, ‘Vicious’ by Halestorm at No. 8, ‘The Greatest Showman’ soundtrack at No. 9 and ‘Cage to Rattle’ by rock band Daughtry at No. 10.